The ESA plans to launch a satellite in 2023 to capture abandoned space junk drifting through space and bring it down to where it can safely burn up in Earth's atmosphere. Using a specialized capture mechanism, the European Space Agency (ESA) plans to lasso a large, abandoned satellite drifting through space and pull it down to burn up in the atmosphere. 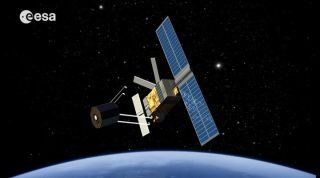 The e.DeOrbit mission, part of the agency's Clean Space Initiative, is designed to capture an ESA-owned satellite that is in low orbit around the Earth but no longer functioning. If all goes according to plan, a capture mechanism — such as a robotic arm, net or harpoon — will latch on to the target in 2023 and bring it down to where it can safely burn up in Earth's atmosphere, ESA officials said in a statement. You can see a video on how the space junk cleaner works here. "While the concept is straightforward, the implementation is not — e.DeOrbit will be like nothing ESA has ever attempted before," Robin Biesbroek, ESA's study manager, said in the statement. "The chaser satellite requires extremely sophisticated guidance, navigation and control to synchronize motion and then capture its target, guided, in turn, by advanced image processing, blending inputs from optical and multispectral cameras as well as 'laser radar' lidar to derive a precise, reliable sense of the target and its motion." After decades of space exploration, there are an estimated 29,000 human-made objects larger than 10 centimeters (4 inches) orbiting Earth, increasing the risk of catastrophic collisions, ESA officials said in a video unveiling the target of the e.DeOrbit mission. Earlier this year, ESA demonstrated the concept of capturing an abandoned satellite by shooting a net at a drone. "In addition, e.DeOrbit needs a reliable method of capturing its target," Biesbroek said. "We are now looking at a net, harpoon or gripper, as well as advanced robotics to secure the two satellites together. Finally, the satellite also requires a very high level of autonomy, because continuous real-time control from the ground will not be practical, especially during the crucial capture phase." Initiatives to capture and remove dead, abandoned space junk become even more essential as the number of space launches per year continues to increase. The ESA video said a 1-cm (2.5 inches) piece of space debris could "strike a working satellite with the force of a hand grenade," which, in turn, could cause a subsequent cascade of collisions and harm any new satellites being launched into space.